The nerves send vital information from your brain and spinal cord to the muscles and organs throughout your body. Compression of these nerves (a.k.a. pinched nerve) may evoke a warning sign, such as pain. The effects of a pinched nerve may be minor or severe dependent on the amount of compression placed onto the nerve. Pressure may be as a result of repetitive movements or due to poor prolonged postures (i.e. sitting in front of the computer). The nerves are most vulnerable to compression in the areas of your body that provide little soft tissue to protect them or through a narrow space. Compression of the nerve may result in inflammation and irritation of the nerve structures, with the potential to have pain radiating from the neck into the arm or shoulder (compression of the nerves in the neck) or into the leg and foot (compression of the nerves in the lower back (a.k.a. 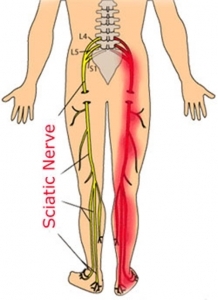 sciatica)). With pinched nerves, sometimes you may experience pain or you may experience pins & needles, numbness or weakness without pain. Physiotherapy treatment is focused on identifying precipitating factors, providing symptomatic relief, ergonomic assessment (where applicable) and identifying postures that reduce the compression on the nerve. In addition, certain medications are available that reduce the irritation of the nerve, which should be discussed with your family doctor prior to commencement. Symptom reduction varies from person to person, which depends on the severity and cause of the nerve compression. If your symptoms persist or you develop significant weakness, it is important to seek medical assessment immediately.